Newborn twins A.J. and Emma Loscheider had only been home for a few days when mom Christena noticed something was wrong with A.J. He was rushed to the hospital, where doctors worked for five months to diagnose his condition – Immune dysregulation, Polyendocrinopathy, Enteropathy, X-linked (IPEX) syndrome. This rare genetic condition, with only 150 known cases worldwide, results in multiple autoimmune disorders. A.J.’s best chance of a cure was through a bone marrow transplant to replace his immune system. Family members were disappointed when none of them were a match for A.J., but that feeling quickly turned to relief and excitement: Gift of Life Marrow Registry found eight potential donor matches for A.J. in its registry on the first day of the search. “It was a great feeling to know that a complete stranger would be willing to help save his life,” said Christena. A.J. and his mother remained in the hospital for months while A.J.’s father Alex, along with family and friends, took care of twin sister Emma and older brother, Breckon at home. A benefit was organized to raise funds for the family, and Christena arranged for donor swab testing at the event as a way of giving back to Gift of Life. 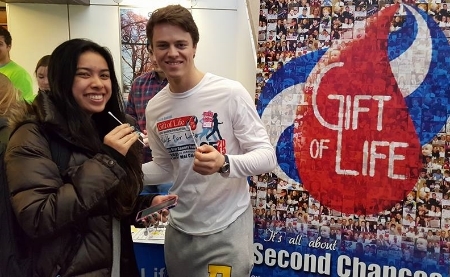 Not long after donating, Nick was asked if he would be interested in Gift of Life’s Campus Ambassador Program (CAP) and he jumped at the opportunity to hold swabbing drives and recruit more donors to the registry. As a donor himself, he was able to answer people’s questions from experience, and his personal commitment and enthusiasm for the organization’s mission helped his team at Tufts recruit large numbers of volunteer donors. While Nick was completing his senior year studying political science and economics A.J. was busy recovering, but Christena and Alex still did not know Nick’s name because donors and recipients must remain anonymous for the first year. Christena said that they had just received the forms to request contact when they got an unexpected call from Gift of Life, inviting them to meet A.J.’s donor for the first time at the One Huge Night Gala in New York on May 17, 2017. Nick graduated from Tufts and now lives in San Francisco, where he works as a business analyst for a financial firm. A.J. is busy growing and playing, as every two-year-old should! You, too, can be a superhero! Individuals 18 to 45 can join the registry at no cost. Call now to order your swab kit: 800-962-7769.